2.1 Why you need CSIR previous year question papers? CSIR or the Council Of Scientific And Industrial Research is one of a premium National research and development organisation in India. It is also one of the world’s largest publicly funded research and development organisation. The major activity of CSIR is to provide various grants through fellowship schemes. You will get the CSIR previous year question papers from this post. CSIR provides JRF or junior research fellowship to students who are interested in performing research in scientific subjects at Masters or PHD Level. If you clear the exam, you get a 25,000/- per month stipend to conduct your research. Aspirants, on current-affairs.org you will get all the necessary information regarding the CSIR – JRF Exam. If you are worried about how to test yourself after preparation, you can study along with CSIR sample paper. 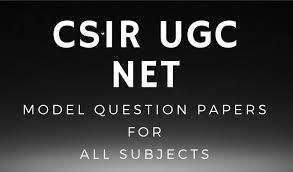 Also, when you study with the CSIR UGC NET question papers, it gets easy to know the standard of the question papers and the level of difficulty. It can only be done through CSIR NET question papers. Sometimes, a lot of students are not able to perform in the exam due to fear of unknown. This happens due to the lack of practice of full-length CSIR NET Sample Papers. Thus you have to be disappointed on the exam day as you cannot solve few questions. The CSIR UGC NET Exam is for 200 Marks. Each segment has different marks. Aspirants seem like it is very necessary that you are able to complete all of the given questions of the CSIR NET Exam. To know the model questions and exam pattern, the CSIR previous year question paper will play a major role. Also, they can help with information like exam pattern and repeated CSIR question. This is done by the CSIR NET Question papers. The papers of CSIR are available in pdf format. This is easy to download and can be accessed through any device. So, candidates who are appearing for this Exam, you should download all these papers that we are providing from various years of the CSIR entrance exams. They will be beneficial for you no doubt. Once you have prepared for the sub posts, start appearing for the test series. Download the CSIR previous year question papers by just clicking on the below link. These papers will help you to understand the exam pattern and question trend for the CSIR exam. Why you need CSIR previous year question papers? It takes a lot more effort to create CSIR NET questions rather than solve them. Yes I know, this seems impossible but that’s the case. So when you are preparing for your CSIR NET exam, it is important that you focus on solving a lot of questions. After a point of time, you will need new questions to practice for CSIR NET exam. You are not going to get questions based on new concepts every other book or study material you open. Let me also tell you that the paper-setters reserve their new questions for CSIR NET exam mock tests. This is where the true test of your whole preparations for NET or JRF exam comes in. Because solving new questions in any CSIR NET exam book is very different to solving those same questions in a paper.